We are in the middle of one of our Companions in Christ groups. These groups are sacred times. We learn how to listen to the still small voice of God in our lives. We learn how to listen to each other. Over the past few years we have had multiple groups. There will be more in the future. Each group has a culture or style all its own based upon who is in the group. People have an opportunity to share as little or as much as they want to. 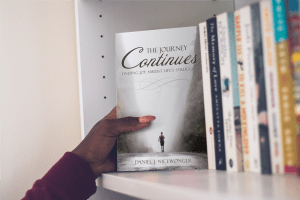 As we share our joys and struggles it is refreshing to know that while our journeys may be different there are common themes that weave their way through life. It is also exciting to hear how God has consistently met people in their times of need. These small groups are the picture of community the way Jesus intended it to be. People coming together, sharing their spiritual journey as they look to grow further and deeper in relationship with Abba Father. If I could spend the rest of my life involved with groups like these I would count it time well spent. Last night was special. 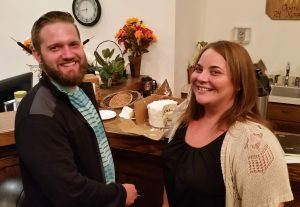 Jill and Andrew walked in with cake. Cake is good. This cake was extra special. It was the top off their wedding cake. It was their anniversary and they chose to spend a part of the evening with their Companions in Christ small group. We enjoyed sharing from the lesson and exercises from the past week and then celebrated their anniversary with cake! I can’t remember if it was Jill or Andrew who was concerned about the cake being a year old…but it tasted great. I was honored to perform their ceremony and now I got to share in their anniversary in this special way. God is good. Nancy could not remember. I seem to remember eating some year old cake at some point but who knows. When we got home Nancy pulled out some pictures of our cake to look at the top to see if that jogged any memories. No luck. It did cause me to think about a few things. 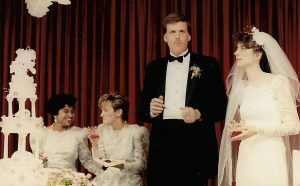 I have been extremely lucky to have Nancy journey with me these past twenty six years. 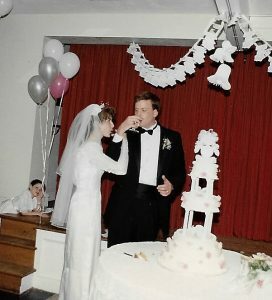 Standing there by the cake on our wedding day I do not think we had a clue as to what life held in store for us. It was probably good we had no idea. Nancy has been an awesome partner in life…I could not ask for any better. I also looked at my hair and could not help but think…I had hair BEFORE I got married…now I do not. I am not suggesting there is a direct connection between the two. But as people search for the cure to male baldness it certainly is something that somebody could look into. Or not. There is a story surrounding our cake. One I will not tell here. I have a picture that captures the story perfectly but I have shown great restraint and not posted it here. If you happen to see my mother in law or Nancy it might be worth asking if they will share the story.